The Downtown Art Walk Celebrates World Art Day! Guest Gallery: Gloria Delson Contemporary Arts, featuring works by Marlene Capell, Crystal Michaelson, and Rene Sheret. The Downtown Art Walk Lounge and Gallery presents a special performance by German-born, L.A.-based artist Lilli Muller. Titled “The Mandala Project - A Collective Meditation on Humanity”, this ongoing series of interactive community performances is in response to the current paradigm shifts and consequential eruptions of drastic changes worldwide. Due to travel around the world to activate public spaces where traumatic upheavals have taken place, this performance series aims to commemorate, celebrate, and heal, while offering a renewed sense of hope. For her special Art Walk performance, Muller will arrange participants in the shape of a mandala in the center of the Edison Room Gallery at the Downtown Art Walk Lounge. As a symbolic representation of the effort to unify, this performance will be a continuous circle created over and over by the “bodies” of passers-by wishing to participate in a public ritual based on both eastern and western concepts of the mandala. Muller will guide participants and audience in a collective moment of silence, to freeze-frame this chain of humanity in one photo capturing an instant of togetherness. This performance offers the community a physical unifying form, built from the people who exist within it, to express the current cultural shifts and preserve some of what is being lost. Additionally, the Downtown Los Angeles Art Walk Lounge will host Grand Park’s Pop Up Park, which will include projected footage of everyday activity from around the world tied to the Portals Project activation in Grand Park, April 10-23. Audiences interested in experiencing Portals Project in Grand Park can sign up for an appointment to speak with someone around the world about life, food, family, the weather or any other topic they want to discuss to gain a new perspective on other communities far away. A vibrant outdoor gathering place, Grand Park is a beautiful public park for the entire community in Los Angeles County. Grand Park’s Pop Up Parks allow a small piece of the 12-acre park to “pop up” in small spaces, along sidewalks, and gatherings. More information about the Portals Project at Grand Park can be found at grandpark.la.org/portalsproject. The Lounge also presents guest gallery, Gloria Delson Contemporary Arts, with works by Marlene Capell, Crystal Michaelson, and Rene Sheret. 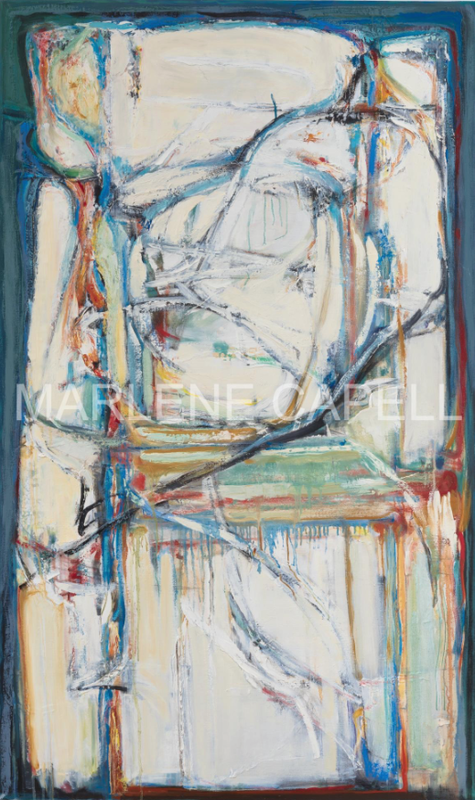 Marlene Capell is a Los Angeles-based Abstract Expressionist painter inspired by music, whose works center on exploration by interweaving and overlaying abstract elements in the composition. Crystal Michaelson is a Los Angeles-based mixed media artist, whose instinctual, gestural mark making, construction, deconstruction and reconstruction draws inspiration from the post war abstract expressionists. René Sheret is a Pasadena artist who uses digital photography to create uniquely beautiful images. Below: Lilli Muller's "The Mandala Project"; Grand Park's "Pop Up Parks" preview of The Portals Project; featured artists by Gloria Delson Contemporary Arts.